Recorded/performed at: Studio 1, BBC Studios, Maida Vale, London, on Feb 98. Percy Grainger Penelope Thwaites, Wayne Marshall, John Lavender, Antony Gray 1 mins, 59 sec. Recorded/performed at: Studio 1, BBC Studios, Maida Vale, London, on Feb 98. Percy Grainger Penelope Thwaites, Wayne Marshall, John Lavender 9 mins, 33 sec. Recorded/performed at: Studio 1, BBC Studios, Maida Vale, London, on Feb 98. Percy Grainger Penelope Thwaites, Wayne Marshall, John Lavender 7 mins, 45 sec. Recorded/performed at: Studio 1, BBC Studios, Maida Vale, London, on Feb 98. Percy Grainger Penelope Thwaites, Wayne Marshall, John Lavender, Antony Gray 2 mins, 45 sec. Recorded/performed at: Studio 1, BBC Studios, Maida Vale, London, on Feb 98. Percy Grainger Penelope Thwaites, Wayne Marshall, Antony Gray, John Lavender 44 sec. Recorded/performed at: Studio 1, BBC Studios, Maida Vale, London, on Feb 98. Percy Grainger Penelope Thwaites, Wayne Marshall, John Lavender 7 mins, 54 sec. Recorded/performed at: Studio 1, BBC Studios, Maida Vale, London, on Feb 98. Percy Grainger Penelope Thwaites, Wayne Marshall, Rhondda Gillespie, Antony Gray, John Lavender 1 mins, 13 sec. Recorded/performed at: Studio 1, BBC Studios, Maida Vale, London, on Feb 98. Percy Grainger Penelope Thwaites, Wayne Marshall, John Lavender 47 sec. Recorded/performed at: Studio 1, BBC Studios, Maida Vale, London, on Feb 98. 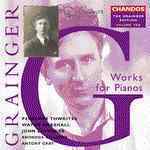 Percy Grainger Penelope Thwaites, Wayne Marshall, John Lavender, Rhondda Gillespie, Antony Gray 5 mins, 32 sec. Recorded/performed at: Studio 1, BBC Studios, Maida Vale, London, on Feb 98. Percy Grainger Penelope Thwaites, Wayne Marshall, John Lavender 9 mins, 19 sec. Recorded/performed at: Studio 1, BBC Studios, Maida Vale, London, on Feb 98. Percy Grainger Penelope Thwaites, Wayne Marshall, John Lavender 4 mins, 14 sec. Recorded/performed at: Studio 1, BBC Studios, Maida Vale, London, on Feb 98. Percy Grainger Penelope Thwaites, Wayne Marshall, John Lavender, Antony Gray 2 mins, 13 sec. Recorded/performed at: Studio 1, BBC Studios, Maida Vale, London, on Feb 98. Percy Grainger Penelope Thwaites, Wayne Marshall, John Lavender 4 mins, 8 sec. This product forms part of the following series: Grainger Edition (volume 10). Liner notes include (in English, French and German) programme notes, and biographical notes on performers. Score: Country gardens : for 2-part (SS or SA) voices a cappella / Percy Aldridge Grainger ; freely arranged by David Tall. Score: Country gardens : for SATB choir a cappella / Percy Aldridge Grainger. Score: Random round / Percy Grainger. Score: Green bushes : passacaglia on an English folksong / by Percy Aldridge Grainger. Parts: The warriors : music to an imaginary ballet for orchestra and 3 pianos / Percy Aldridge Grainger, dished-up by the composer for 2 pianos, 6 hands.